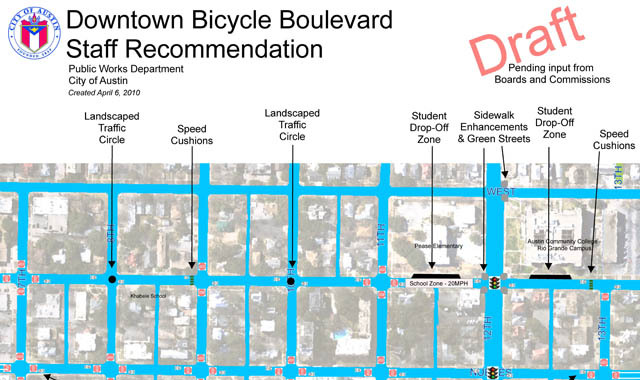 This project recommendation sheet identifies an integrated set of volume and speed management treatments to establish a bicycle boulevard. The E Mifflin Bike Boulevard provides a low-stress alternative to the parallel bikeway routes. The E Mifflin Bike Boulevard provides a low-stress alternative to the parallel on-street bikeway routes. 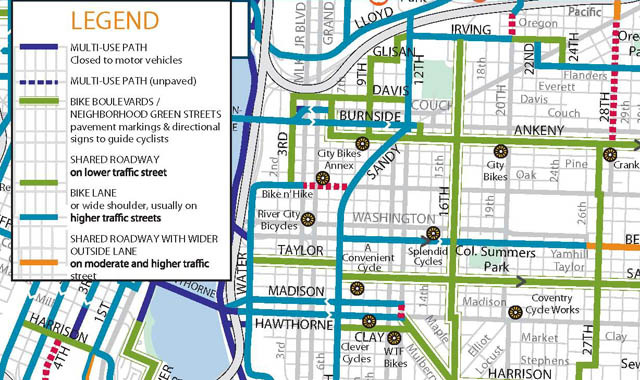 The Portland bicycle network provides neighborhood greenways as an alternative to riding on high traffic streets. 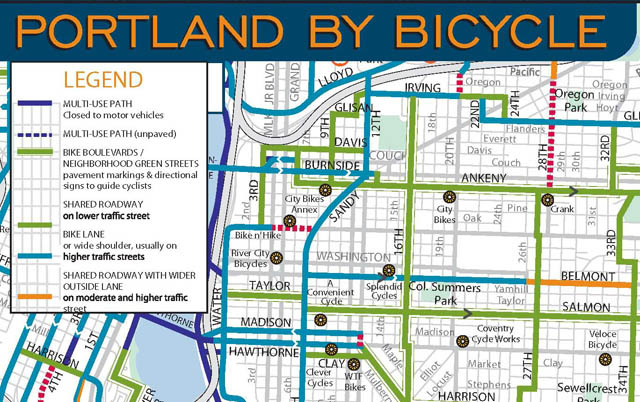 The Portland bicycle network provides bicycle boulevards as an alternative to riding on high traffic streets. Proposed improvements to the 4th to Fontanata Bike Boulevard include speed tables, intersection treatments, and mini traffic circles. 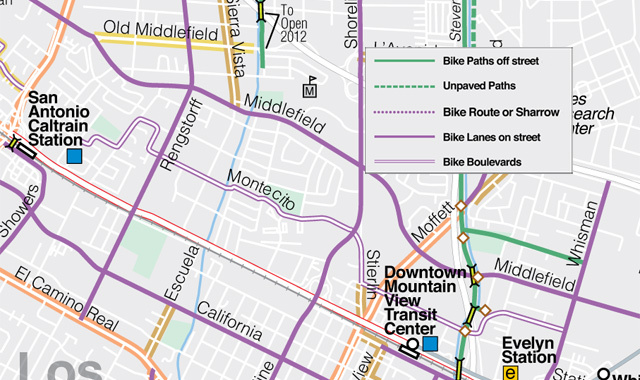 Multiple routes may be appropriate candidates for bicycle boulevard treatments. 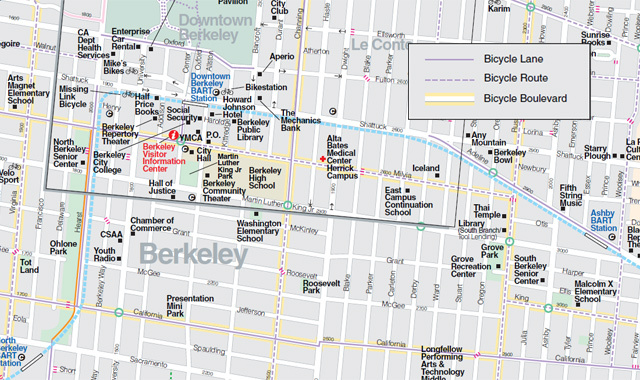 Berkeley\'s bicycle boulevard system contains short segments of traffic calmed streets with bicycle lanes to facilitate network connectivity between low-traffic streets. 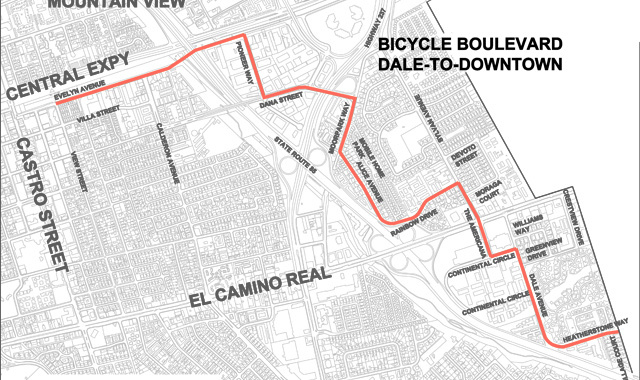 The Dale-to-Downtown Bicycle Boulevard provides a low-stress route from Downtown Mountain View to neighboring Sunnyvale, CA. The Cities in the Santa Clara Valley use a range of different treatments to low-traffic streets including wayfinding signage and shared lane markings. 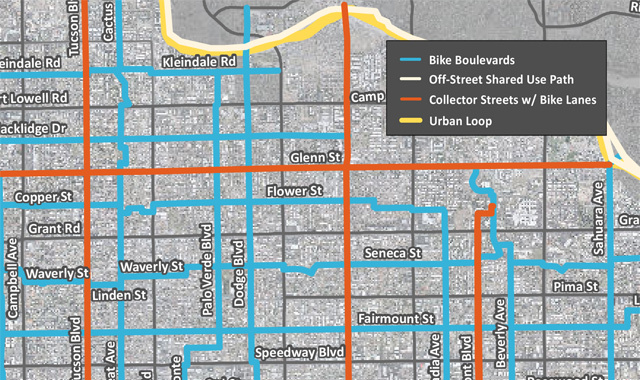 Tucson\'s extensive network offers bicyclists a choice of bike lanes, bicycle boulevards, and off-street paths enables bicyclists to choose the facility type that best suits their needs. 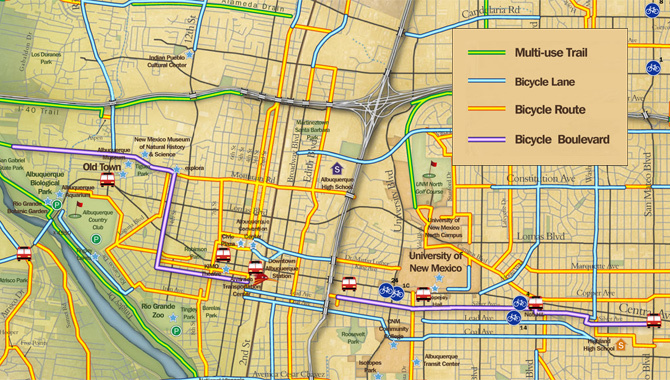 A mix of signed bicycle routes, bicycle boulevards, bike lanes, and off-street paths make up Albuquerque\'s connected bikeway network. 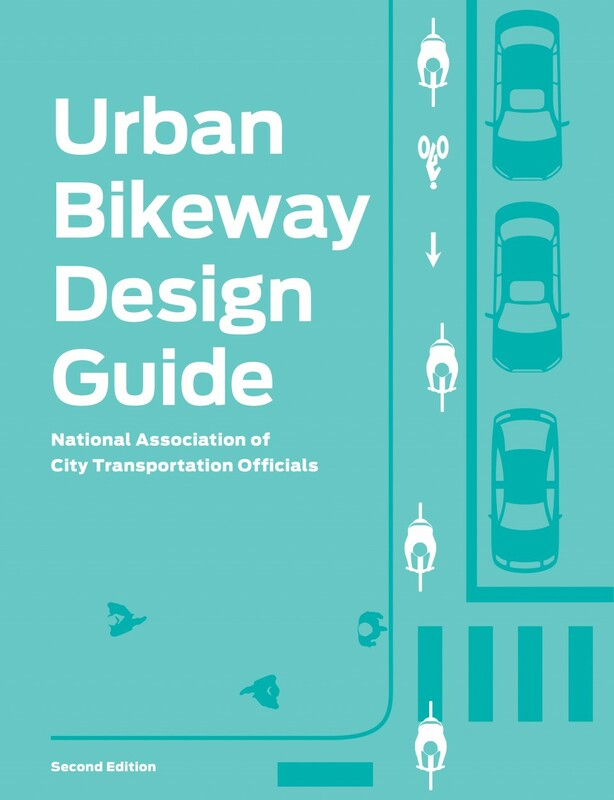 Low-stress bikeways, which include cycle tracks, buffered bike lanes, and off-street paths, appeal to a wider spectrum of the population than conventional bike lanes or shared lanes along busy streets. A low-stress network should be fine-grained and many jurisdictions aim to provide a density of low-stress facilities at quarter- or half-mile intervals. A bicycle boulevard should be considered where local streets offer a continuous and direct route along low-traffic streets (or a route interspersed with bicycle/pedestrian-only connections). 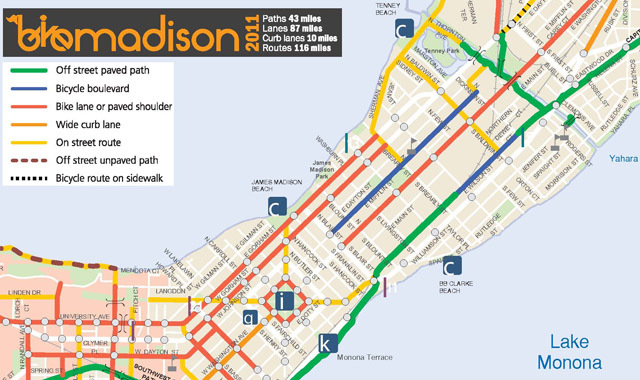 A candidate route can be enhanced by treatments described elsewhere in this section: speed management to reduce traffic speeds, volume management to lessen traffic volumes, minor street crossing treatments to reduce bicyclist delay, and major street crossing treatments where a route crosses a major street. A bicycle boulevard running parallel to a major roadway can provide access to commercial destinations for people who do not feel safe riding along the main street particularly in cases where the main roadway lacks a low-stress or protected facility. It is important to note that low-stress bikeways should be provided wherever possible along major roads, even where a parallel bicycle boulevards= exists. Similarly, bike lanes along a commercial corridor are not an equivalent substitute for bicycle boulevards; many people are uncomfortable riding on higher-speed streets and should be provided an alternative route to access commercial areas. Though many practitioners begin defining a bicycle boulevard route by locating key opportunities, especially crossings of barriers, such as at existing bicycle/pedestrian-only crossings of parks, highways and rivers, as well as existing or potential at-grade crossings (such as traffic signals) of major streets. In many areas, local streets are discontinuous or not in a grid pattern, and the route between key crossings may require significant diversion. In some cases, the addition of a bicycle/pedestrian-only link, such as a path through a park, a footbridge over a river or highway, or a short connection between two cul-de-sacs, can overcome a major barrier to connectivity and become the keystone of a bicycle boulevard route. Routes that require significant diversion are inappropriate for bicycle boulevards. Bicyclists are typically willing to deviate from the most direct route for only very short distances (two to three short blocks), to overcome a barrier, access a continuous bicycle route, or access a specific land use. Depending on the length of the diversion (and steepness of the hill) bicyclists also tend to be willing to travel out of direction to avoid steep grades. Though generally undesirable, if a direct connection uses an existing staircase to cross an obstacle (such as at an overcrossing), a ramp or a stair channel should be provided. A climbing bike lane (see shared lane markings) may be appropriate on steep bicycle boulevards, although bicyclists’ ability to traverse the hill by using the full lane should be weighed with the motor vehicle volumes on the road. 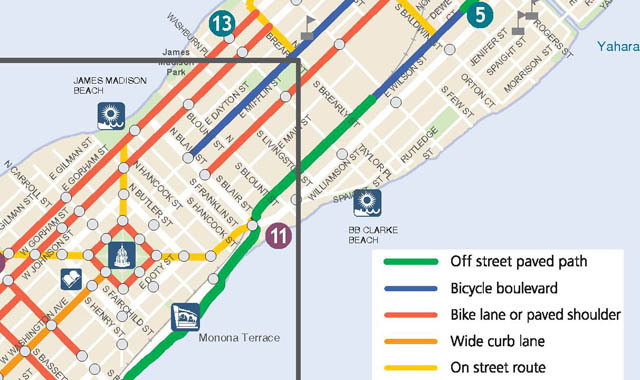 The advantage of the bicycle boulevard—bicycling on a quiet, safe and residential roadway,—can also be its downside, as these routes may be less visible and intuitive than major parallel streets. Thus one goal of marking a bicycle boulevard route is to make it as clearly visible to people as a bicycle route as are streets striped with bicycle lanes or developed with cycle tracks. A second goal is to encourage people to bicycle along the route and to alert drivers that they should expect to encounter people bicycling. A third goal of marking the route is to communicate that bicycle travel has priority on the roadway. This visibility can be accomplished through wayfinding signs and pavement markings. Additional elements, such as art, public spaces, and landscaping, further increase the visibility of the corridor. The bicycle boulevard should also be actively marketed through events, activities, and maps to help reach its potential. Facilitating awareness of and education regarding the many benefits of bicycle boulevards for all types of roadway users can improve public perception, build support for additional treatments and provide confidence to new bicyclists. Streets formally designated as bicycle boulevards should meet strict targets of fewer than 3,000 motor vehicles per day (1,500 preferred) and an 85th percentile speed of no more than 25 mph (20 mph preferred). Traffic conditions, including motor vehicle speeds and volumes and bicyclist delay, should be monitored before implementation and on a regular basis after implementation. Should conditions exceed the target thresholds, additional speed and/or volume management treatments should be implemented. Intersection treatments that reduce delay can make bicycle boulevards more attractive for cut-through motor vehicle traffic, necessitating periodic monitoring of motor vehicle speeds and volumes. While most bicycle boulevards are located on residential streets, they can also be designated along commercial or industrial streets with low vehicular speeds and volumes. Because of the greater intensity of access demand on commercial streets compared to residential streets, volumes up to 3,000 vehicles per day (vpd) can be acceptable, though below 1,500 vpd is always preferred. However, due to the higher number of vehicles, which often include more heavy vehicles, motor vehicle speeds should be reduced to 20 mph or less. 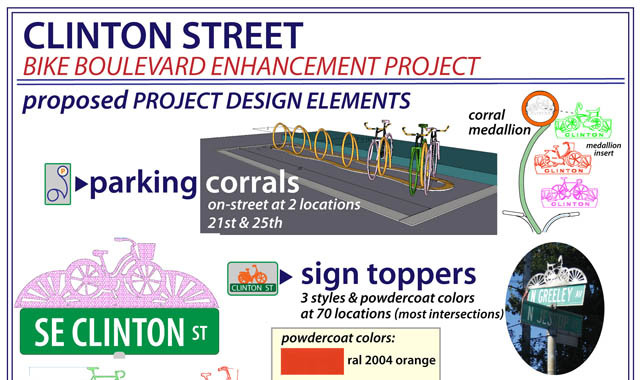 Additional signs and markings are encouraged to improve the visibility of the corridor as a bicycle boulevard. Emergency vehicle routes should form a regular grid of streets that concentrate emergency responses on streets that are wider and provide mobility across a jurisdiction. Such streets will often have signals that can be pre-empted to facilitate emergency response. The wider streets also permit auto traffic to move aside more easily, clearing a pathway for emergency vehicles. Such streets rarely coincide with bicycle boulevard streets, which can prevent the need for trade-offs between speed/volume management and emergency response delay. See the U.S. Traffic Calming Manual for specific emergency-vehicle-friendly recommendations. It should be clear from the beginning of a bicycle boulevard implementation process that not only are volume and speed control measures allowed on the route in question, but that emergency-vehicle-friendly access will be provided through the closure. Emergency response maps must be updated to reflect any volume control measures implemented. Similarly, bicycle boulevards can be designated on lightly-traveled corridors that also serve as minor transit routes. Bicycle boulevards are incompatible with routes with a significant amount of heavy vehicle traffic. All intersections along bicycle boulevards should minimize delay and improve safety for bicyclists on the bicycle boulevard. These two goals can be accomplished with a variety of treatments, including supplemental signs and markings, geometric design features, and traffic control. 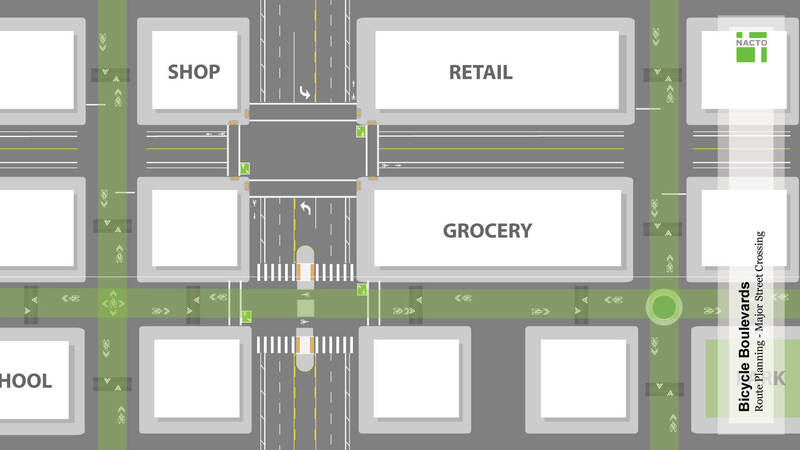 While all crossing treatments should provide both benefits, there are trade-offs between these goals, which vary based on the operational characteristics of the cross street. In some cases, local streets intersect either minor or major streets at a “dog-leg” intersection. 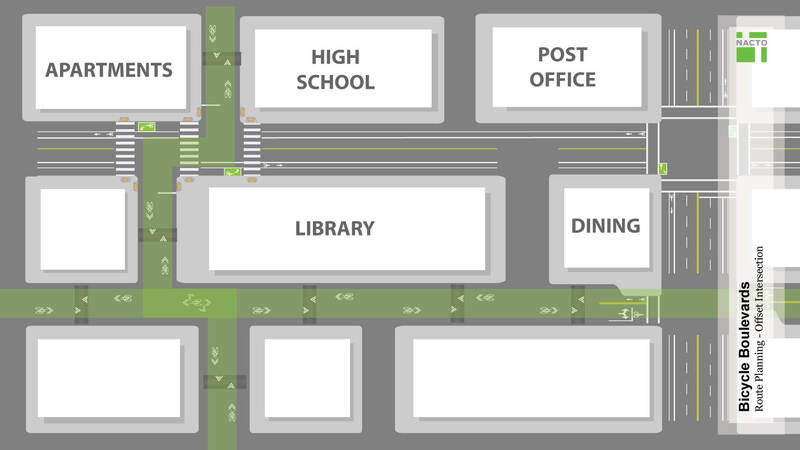 See Offset Intersections for guidance on providing comfortable and direct bicycle access through such intersections. At Minor Street Crossings or intersections with other local streets, crossing treatments primarily reduce delay for users on the bicycle boulevard. If stop signs require people on bikes to stop repeatedly, they may be more likely to seek other routes, disregard the stops signs or not bicycle at all. Improved safety at these minor intersections should include appropriate traffic control for cross traffic with optional supplemental warning signs and other treatments that improve the visibility of the bicycle boulevard. Bicyclists can expect some delay at crossings of major streets that have more motor vehicle traffic than the bicycle boulevard and therefore have right-of-way priority. As the complexity of the cross street increases, bicyclists are willing to trade off delay for increased safety and comfort at the crossing. However, bicyclists will not and should not be expected to tolerate excessive delay, which can result in poor compliance or lower bicyclist volume than desired. On larger streets with three or more travel lanes and/or posted speeds of 35 mph or higher, bicycle boulevard crossings should be accommodated with median refuge islands, beacons, or signals. Engineers should employ techniques that seek to both maximize safety and reduce delay, especially at signalized crossings. 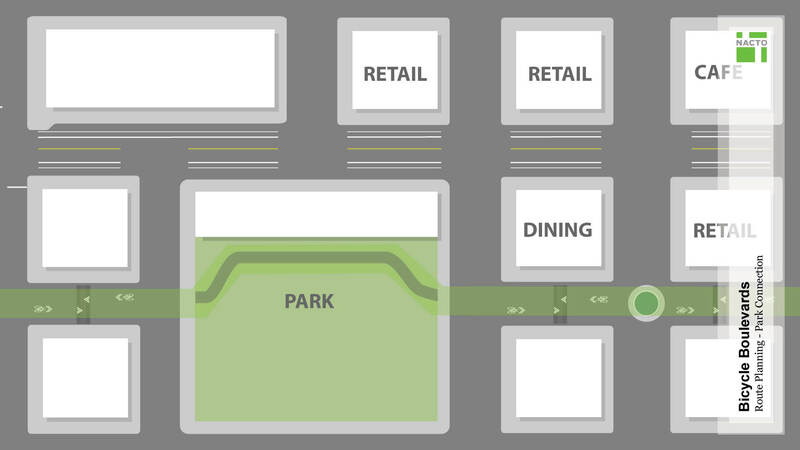 Click on the images below to view concepts of route planning. Dill, J., and Gliebe, J. (2008). Understanding and Measuring Bicycling Behavior: A focus on travel time and route choice. Oregon Transportation Research and Education Consortium (OTREC). Hunt, J.D., and Abraham, J.E. (2007). Influences on bicycle use. Transportation 34.4: 453. Speed management and other bicycle boulevard treatments on a street in Berkeley, California, reduced the number of automobiles by almost 20 percent, while the number of bicyclists and pedestrians increased by 83 percent and 87 percent, respectively. Bouaouina and Robinson (1990) in Ewing. (1999). Traffic Calming: State of the Practice. Minikel, E. (2011). Cyclist safety on bicycle boulevards and parallel arterial routes in Berkeley, California. Accident Analysis and Prevention. 45: 241-247. 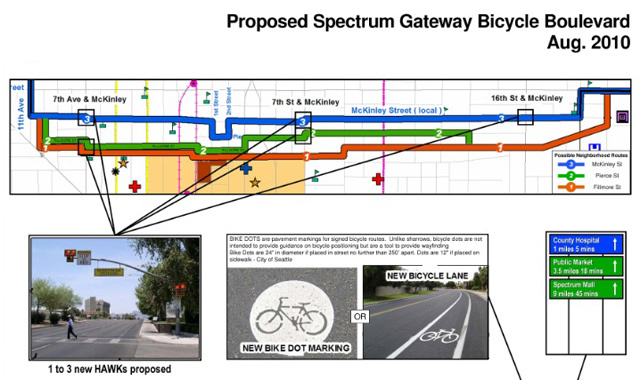 Can make cost-effective use of existing roadways and connections with a series of relatively minor treatments that substantially improve bicycling conditions on local streets. VanZerr, M. (2009). 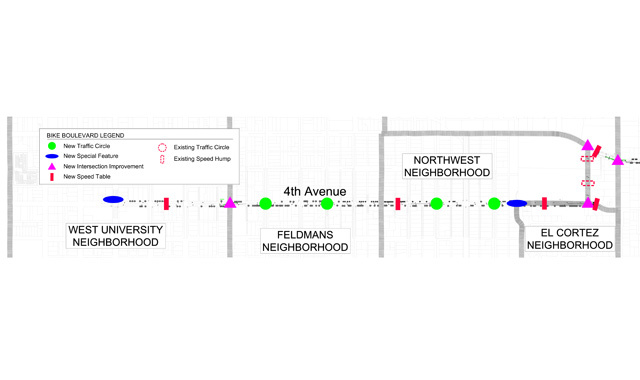 Resident Perceptions of Bicycle Boulevards: A Portland, Oregon Case Study. Litman, T. (1999). 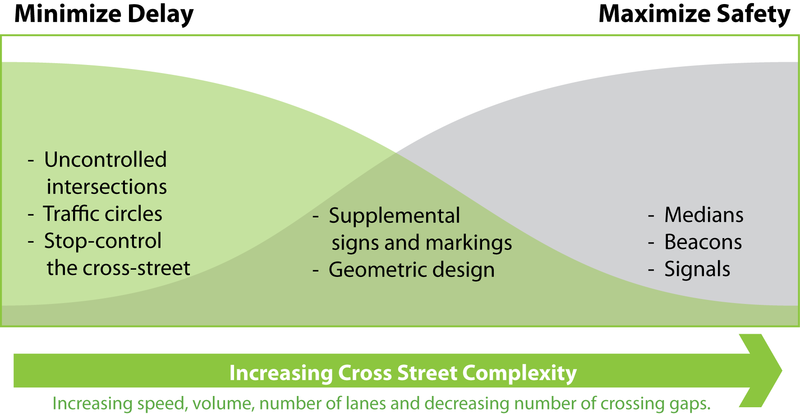 Traffic Calming Benefits, Costs, and Equity Impacts. Can benefit pedestrians and other users through crossing improvements, wayfinding, landscaping, and reduced motor vehicle speeds and volumes. Portland, OR, and Albuquerque, NM, have designated lower speed limits for residential streets—20 and 18 mph, respectively—for residential streets classified as bicycle boulevards/neighborhood greenways. Streets where a relatively continuous route for bicyclists exists and/or where treatments can provide wayfinding and improve crossing opportunities at offset intersections (often streets where people are already bicycling). Streets where bicyclists have right-of-way at intersections or where right-of-way can be established. Signs and pavement markings shall be utilized to identify the corridor as a bicycle boulevard, make the facility as visible as streets with bicycle lanes, cycle tracks, or other bicycle facilities. Speed management techniques shall be implemented, if needed, to reduce 85th percentile motor vehicle speeds to or below 25 mph (20 mph or less always preferred and required where motor vehicle volumes exceed 1,500 vpd). Volume management techniques shall be implemented, if needed, to reduce motor vehicle volumes to or below 1,500 or 3,000 vpd, depending on the roadway characteristics. Minor street crossing treatments shall be implemented to minimize bicyclist delay along the route. Major street crossing treatments shall be implemented to maximize bicyclist safety and comfort at crossings. Offset intersection treatments shall be implemented to be obvious and maximize comfort for the bicyclist along the route. Wayfinding signs and pavement markings should be used to tie the bicycle boulevard to nearby land uses and to direct users through turns and jogs. Pavement quality should be fair to good and the street should be prioritized for repaving and other maintenance activities over other local streets. Green infrastructure, including bioswales and other storm management techniques, street trees, and pocket parks, may be provided where opportunities present themselves. Enhanced signage beyond simple identification or wayfinding signs may be used to improve visibility and awareness of the route. Art work may be used to enhance the user experience. Bicycle boulevards should be kept in good condition, with a smooth riding surface. Many cities have maintenance schedules for resurfacing and rehabilitating road surfaces. Local streets are typically the lowest priority for repaving, but bicycle boulevards should have a higher priority for repaving or spot improvements than other residential streets. If no budget is available for repaving, the candidate bicycle boulevard route should have good pavement conditions, or an alternative route may be considered. Bicycle boulevards can incorporate sidewalk maintenance, including curb ramps and painted crossings. These corridors are often branded as neighborhood greenways to emphasize the benefits to all road users. Where used, green street treatments and other landscaping must be maintained to preserve visibility. Bicycle boulevards are implemented as Local Street Bikeways and Neighborhood Greenways in Vancouver, British Columbia. References for Route Planning: 10 found. Minikel, Eric. 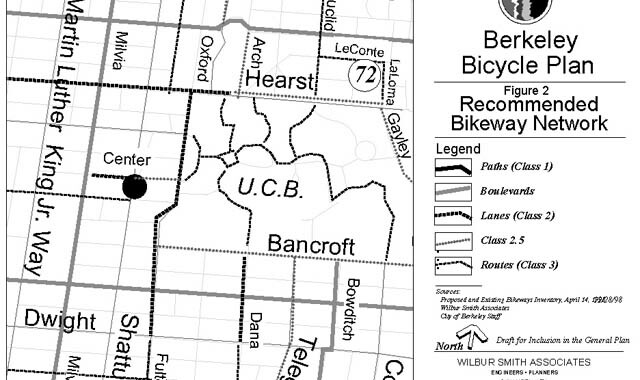 "Cyclist safety on bicycle boulevards and parallel arterial routes in Berkeley, California." Massachusetts Institute of Technology, Accident Analysis and Prevention, New York, NY. Alta Planning + Design. "Emeryville Pedestrian and Bicycle Plan Memorandum: Bicycle Boulevard Treatments." Department of Public Works, City of Emeryville, Emeryville, CA. Hunt, JD, & JE Abraham. "Influences on Bicycle Use." Transportation 34:453–470, Springer Science+Business Media, New York, NY. Angelou, Angelos, Carrie Yeats, & Jeremy Zaborowski. "Literature Review and Impact of the Bicycle Boulevard." Presented to the City of Austin, Texas, Angelou Economics, Austin, TX. Vanderslice, Ellen, Roger Geller, Denver Igarta, Sarah Figliozzi, David Amiton, Todd Borkowitz, et al. "Portland Bicycle Plan for 2030." Bureau of Transportation, City of Portland, Portland, OR. VanZerr, Mariah. "Resident Perceptions of Bicycle Boulevards: A Portland, Oregon Case Study." Paper presented at the 89th TRB Annual Meeting, Transportation Research Board, Washington, DC. Litman, Todd. "Traffic Calming Benefits, Costs, and Equity Impacts." Victoria Transport Policy Institute, Victoria, BC. Dill, Jennifer, & John Gliebe. "Understanding and Measuring Bicycling Behavior: a Focus on Travel Time and Route Choice." Portland State University Center for Transportation Studies, Oregon Transportation and Education Consortium, Portland, OR.